What’s the Difference Between the SF86 and SF85? If you apply for a position that requires access to sensitive information, you’ll need to fill out an application for eligibility. That may be one of two forms – the SF-85, or the SF-86. The SF-85 is used for public trust or lower-risk positions. 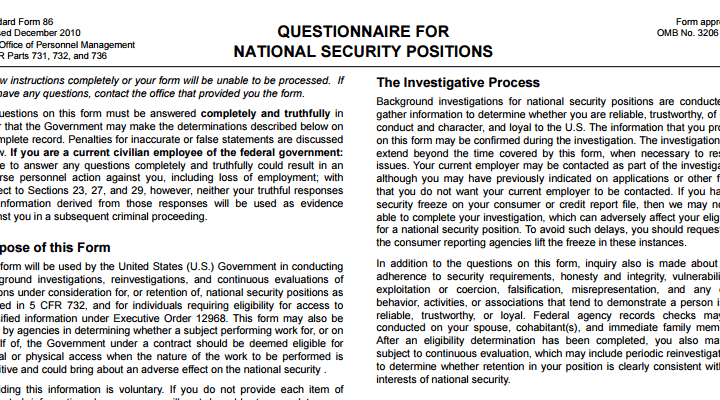 The SF-86 is used for all security clearance determinations, including Secret and Top Secret clearances. The forms are similar. The SF-85 requires slightly different information in terms of reporting dates, so pay attention to how far back you’re required to list information such as criminal or employment history. When filling out either form, the devil is in the details. Make sure you get the correct one from your security officer, and consider carefully filling out a paper copy before you submit the form electronically.